Posted April 6, 2013 by laurielmorrison & filed under Middle Grade Literature, Posts with specific prompts or suggestions for specific assignments, units, and books, Teaching. 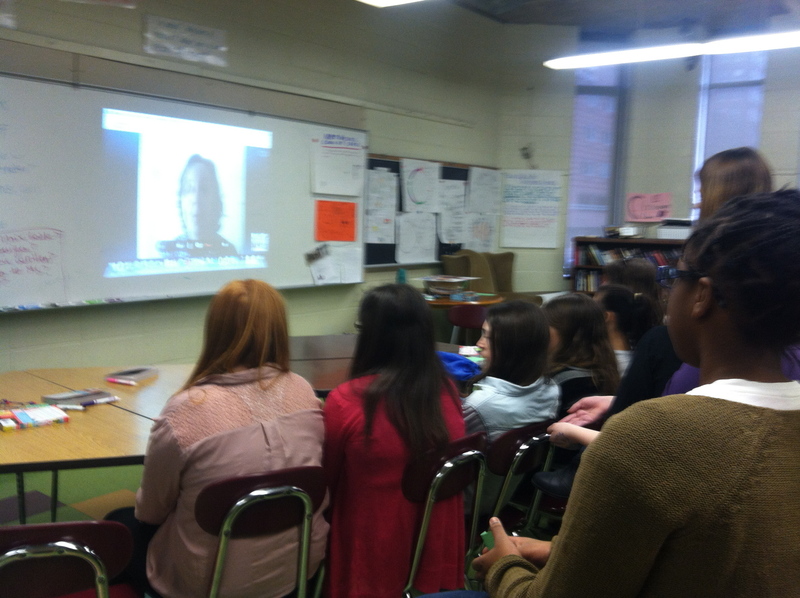 Now that I’ve made it through the first week back from spring break, I’m finally getting around to writing about something that happened just before vacation: a two-day “Middle School Girl Culture” mini-course that included a successful Skype visit and other fun events. My friend and colleague Maureen and I led a course for fifteen sixth, seventh, and eighth grade girls. One of the highlights of the mini-course was a discussion of Jessica Leader’s book Nice and Mean followed by a Skype visit with Jess. I am gradually refining my process for Skype visits, and I thought this one went especially well. I always have students brainstorm questions beforehand, but this time we made sure that we had a varied list of questions, and then we set ourselves up so that we could go down the line and ask the questions in a logical order. We were able to proceed more efficiently since I didn’t have to call on people this way. We also came up with some back-up questions; in case Jess happened to answer someone’s question in her response to another question, there were some fallback options. Jess was articulate and good-humored as she answered the girls’ questions about the characters from Nice and Mean, her writing process, and her own middle school experience. One of the photos we examined from Lauren Greenfield’s “Girl Culture” collection. During the mini-course, we also looked together at a handful of photographs from Lauren Greenfield’s powerful “Girl Culture” photo collection, and we went through some case studies that explored dilemmas related to social media sites. These case studies came from the Ethics Institute at Kent Place School. Facilitators from Swarthmore College’s psychology department led an empowering Strength and Resilience workshop that helped the girls identify their strengths, and we watched some of Rachel Simmons’s BFF 2.0 videos, which are aimed to “help girls deal with the new friendship challenges posed by technology.” Finally, the girls made their own BFF 2.0 videos, in which they explored and gave advice for navigating the issues of group texts, TBH (to be honest) and ratings posts on Facebook, and online gossiping. We also made time to venture out to the Comcast Center and Reading Terminal for our lunches, and we fit in a trip to Rita’s for free water ice in honor of the first day of spring (despite the fact that we were all wearing our winter coats). It was a great two days, and I enjoyed exploring the issues that affect middle school girls today with a group of open and thoughtful young women! Laurie, I love that mini-course! So creative. I’m so glad you got to talk to Jess. And thanks so much for the head’s up on Rachel Simmons. I watched, “BFF 2.0: Is She Really Kidding? The Problem With ‘Joking’ Online.” Ah. Excellent. I bookmarked her site. Laurie — I wish I could have sat in on that mini-course! Thanks for sharing your positive experience of going through the course and offering your girls concrete tools for navigating the internet and relating to one another. Very cool! A teacher after my own heart! I use Girl Culture all the time as inspiration for my middle school short stories. I actually have had a photograph from that book displayed on my desk for the past two weeks that I’ve decided is what one of the main characters looks like. Powerful stuff.